The Senate on Thursday rejected the nomination of Ibrahim Magu as the Chairman of the Economic and Financial Crimes Commission (EFCC). In a voice vote the Senate rejected Magu’s nomination as the substantive Chairman of the EFCC and this is the second time the Upper Chamber of the National Assembly is rejecting Magu. The Senate rejected the nomination following a letter by the Department of State Security (DSS) which upheld an earlier letter that Magu failed the integrity test and was unfit for the office. The DSS letter which was sent to the Senate on Wednesday stressed that Mr Magu would constitute “a liability to the anti-corruption fight of the present administration”. The recent letter by the DSS was sent to affirm its stance on an earlier letter sent to the Senate on Oct. 3, 3016 stating that Mau was unfit for the job. The Senate had begun the screening of the acting EFCC boss as scheduled and Magu fielded question on different issues bordering on the operations of the commission. Although some tooth aching questions were asked which Magu couldn’t answer, the turning point came when the letter from the DSS was re-introduced. Sen. Dino Melaye who disclosed the content of the letter on the floor of the Senate asked the nominee if would be okay to go on with the confirmation in view of all the allegations against him. Mr Ibrahim Magu who did not take on the question directly however said in an interview after the screening that he was not given fair hearing by the DSS as he was never invited for questioning on any of the issues raised. The letter from the DSS obtained by our correspondent was signed by Folashade Bello for the Director General of SS. 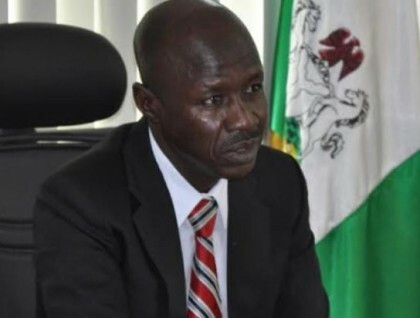 The DSS questioned the circumstances surrounding the return of Ibrahim Magu to the EFCC under the leadership of Ibrahim Lamorde who had been indicted of ‘corrupt tendencies’. The security body reported that Magu lives a life style that was beyond his means: flying first class against the directive of President Muhammadu Buhari and associating with people being investigated by the commission. It further stated that Magu lived in a N20 million per year apartment rented for him by an individual being investigated by the Commission – This allegation Magu however denied during his screening saying that the apartment which he occupied was rented by the Minister of FCT. However the DSS letter further stated that the Acting EFCC boss had failed the integrity test which is a pre-requisite for screening any nominee. The letter added that Magu embarked on many operations to settle personal scores and harassed individuals who had no real corrupt allegations against them. Magu’s nomination was earlier rejected by the Senate last Year following allegation of graft levelled against him by the Department of State Security Service (DSS). After the rejection in December, in a press briefing, The Chairman of Senate Committee on Media and Public Affairs, Sen. Sabi Abdullahi, said: “The Senate wishes to inform the general public that based on security reports available to the senate, it cannot proceed and confirm the nomination of Ibrahim Magu as the Executive Chairman of EFCC. “Accordingly, the Senate hereby rejects the said nomination and has returned it to Mr President for further action’’. President Muhammadu Buhari in a letter sent to the Senate shortly before he embarked on medical vacation in January, cleared the Acting EFCC Boss of all indictments. In the letter addressed to the President of the Senate, President Buhari expressed confidence that Magu carried out the anti-corruption crusade in line with the vision of the administration.